Why this magical island is the Seychelles ultimate secret. Cradled between three jagged granite peaks in the middle of the Indian Ocean is one of the most enchanting private islands on earth. Lined with luminous white sand beaches and alive with lush tropical forests teeming with exotic wildlife, this eco paradise called North Island draws celebrities, royalty and the world’s most elite travelers year after year. However, North Island was not always so magical and even today is facing severe environmental threats. From 1826 until the 1970s, North Island, which is part of the Seychelles, was a coconut plantation owned by a French family until the market suddenly collapsed and the island fell into disuse. Seeing the opportunity to create something exceptional, Wilderness Safaris — the renowned South African conservation company with a strong luxury tourism business — purchased North Island in 1997 and began one of the most challenging and successful natural habitat rehabilitations in history. Not only was this rehabilitation crucial for the health of the island, it was crucial for the Seychelles which consists of over 100 islands that have undergone a tragic coral die-off and are battling rising sea levels. The fragile ecology of hundreds of islands around the world has been irreversibly damaged by humans and sadly many islands of the Seychelles, like North Island, suffered the same fate. The Wilderness Safaris team shared that even before colonialists settled on the islands around 1756, there were early traders who brought foreign plant and animal species that threatened the island’s balance and nearly destroyed it’s habitat. After visiting the island today, it’s hard to imagine that it was once overrun with cows, pigs and thousands of rats. It took the Noah’s Ark Team almost eight years but by 2003, North Island was fully resorted and thriving. To further ensure the island would remain as biologically healthy as possible, North Island built a strong partnership with the Biodiversity Center on Mahé, the capital of the Seychelles, which supplied seeds and cuttings of native species to plant. The team also decided to build only 11 private villas instead of the hundreds they could have built. Each villa is crafted from local materials harvested during the island rehabilitation process and designed to feel like your own magnificent yet private beach house. Guests are also delighted to find their own golf cart and bicycle are provided enabling you to create your own personal island adventures. Each villa also gives direct access to the beach and warm turquoise waters of the Indian Ocean and if you prefer guaranteed privacy you can reserve an entirely private beach on the west side of the island for a day. This beach is aptly called “Honeymoon Beach” and Princess Kate and Prince William, as well as George and Amal Clooney are rumored to have enjoyed time there and in the Presidential or “Honeymoon” Villa. What’s incredible about North Island goes far beyond the villas, the decadently prepared fresh seafood, or the magnificent views. It’s that the rules on North Island are the ones you make yourselves. With so many demands in our fast-paced lives, it’s so important to take time to reconnect with ourselves and spend time immersed in nature, clean air and lay under bright blue skies. There are indeed a slew of activities if you are feeling adventurous and one of the most popular is scuba diving as the Seychelles has some of the best diving opportunities in the world. The scuba center is housed in an impressive historic building made completely of coral and offers full PADI tuition and certification. With so much wildlife on North Island, another activity guest’s love is being able to interact directly with conservation experts who live on the island and can take you hiking and bird watching while sharing the background of their conservation and island rehabilitation program. The island is famed for its giant tortoises — some of which have been living on North Island for over one hundreds years. When North Island was purchased, only a handful of Giant Tortoises were left but today baby tortoises are born annually and the current tortoise population is estimated to be between 80 and 100 individuals. Interacting with these gentle giants is quite a spectacular experience, especially with a conservation expert who can share with you the animal’s name, their history and detailed information on their habitat and behaviors. The conservationists also point out foods that have been consumed on the island throughout history, many of which the chefs still use today. Half-day fishing excursions give you the chance to catch your own meal with Dorado and Bonito being popular catches. North Island also has its own organic nursery, which produces a wide range of 100% Organic seasonal fresh fruit and vegetables, and while the island prides itself on having a menu-less approach, guests often request the fresh salads and vegetable dishes time and again. If you have dietary restrictions it’s also no problem as you are asked to discuss your meal preferences with the chefs prior to arriving so everything is catered perfectly to you. As North Island is a destination unlike any other on earth and requires arrival via helicopter or private speed boat, the best way to book your stay on North Island is with Darren Humphreys, owner of Travel Sommelier. Darren is a renowned consultant destination specialist who focuses on luxury safari travel, along with bespoke wine and food tourism. 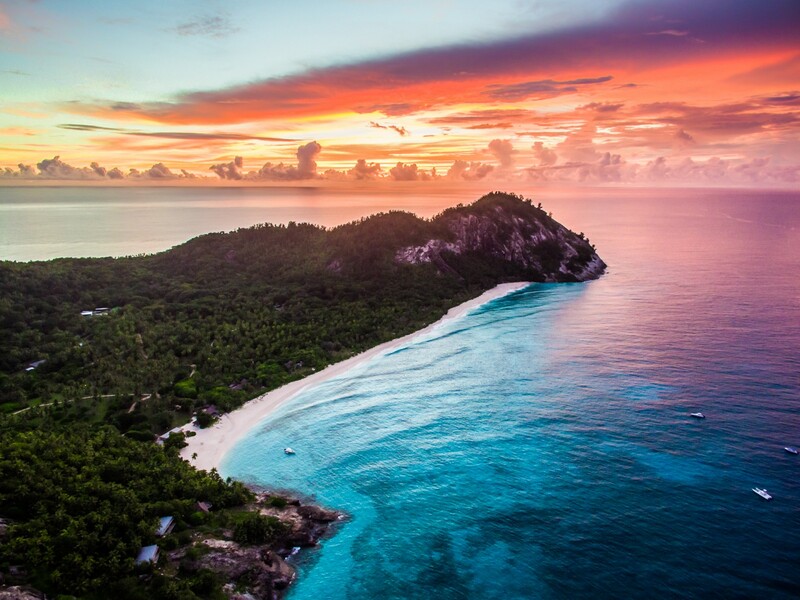 In some cases, the trip to North Island may require an overnight in either Johannesburg, South Africa or Mahé, the largest island in the Seychelles. If you’re stopping over in Johannesburg, Athol Place, a former private residence that has elegantly merged luxury and sustainability is ideal. If you’re stopping in Mahé, check out the Eden Bleu Hotel , another conservation-focused property built on a marina surrounded by lush mountains and crystal blue water. Both hotels can also be booked through Travel Sommelier.